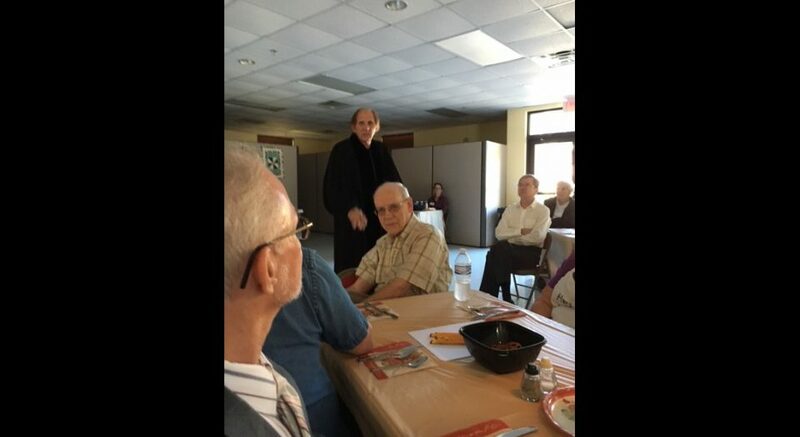 Members of Living Grace Lutheran Church, Tucker, Ga., listen to "Martin Luther" talk as part of a Reformation observation kickoff event. Editor’s note: Throughout 2017, we’re highlighting reader submissions of ways they’re observing the 500th anniversary of the Reformation. Submit your story by sending 300 words or less, plus photos, to livinglutheran@elca.org, with “Reformation story” in the subject line. As a prelude to the commemoration in 2017 of Martin Luther’s 500th anniversary of nailing 95 theses on the door of the Castle Church in Wittenberg, Germany, Living Grace Lutheran Church in Tucker, Ga., hosted “students” from the University of Wittenberg (students being the congregation of Living Grace). After the Sunday morning church service, the “students” went to the fellowship hall where tables and chairs had been set up. When all were seated, in walked “Martin Luther,” portrayed by Charles Beckler, pastor and itinerant speaker. Luther taught the students about God’s grace and the need to believe in Jesus to be saved. A lunch of German potato salad, brats, red cabbage and sauerkraut with German chocolate cake for dessert followed. Everyone agreed it was the best Reformation celebration event. –Submitted by David E. Hardy, pastor of Living Grace Lutheran Church, Tucker, Ga.